The Oregon Coast is a priceless treasure. It is sandy beaches, rocky cliffs, and gigantic sand dunes. The Pacific Ocean provides crashing waves, beautiful sunsets, recreational spaces, and a variety of seafood. However, a controversy is growing – should Oregon devote its coast to the production of wave energy? 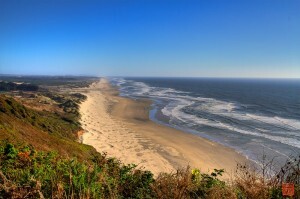 Oregonians love spending time at the coast. We flock there on weekends, causing traffic jams on Highways 26 and 101. Visitors come from all over the world to enjoy our coast. Since 2004, when a 1% hotel occupancy tax went into effect to fund Travel Oregon, the state tourism commission, Oregon has gone from 47th in the nation to 26th for tourism budgets. There are so many international visitors that Lincoln City put up banners that say “Welcome” in Spanish, German, Italian, Chinese, Korean, and Japanese. 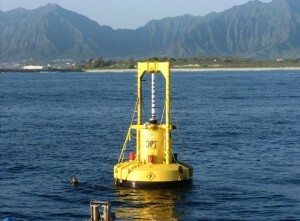 A sample wave energy device that may be deployed off the coasts of Oregon. 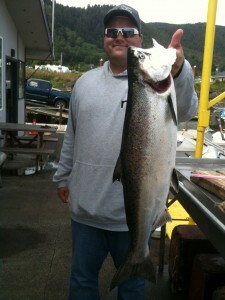 Quietly, a new industry has been growing that may have dramatic impact on the Oregon Coast. A whole group of agencies and non-profits have grown up since 2000: The Oregon Wave Energy Trust, the Oregon Innovation Council, Northwest National Marine Renewable Energy Center (a cooperative effort of Oregon State University and the University of Washington), Pacific Marine Energy Center, the Ocean Policy Advisory Council, and many others. More than $15 million has been spent on developing wave energy since 2006. These diverse enterprises are working toward building wave energy converters off the Oregon Coast. The Northwest National Marine Renewable Energy Center wants a piece of ocean one square mile in size, two miles northwest of Yaquina Head. Aquamarine Power applied for the use of 7,000 acres along the Oregon coast in order to discover what might be the best location for a converter, which is 70 feet deep by 1,400 feet long and rises over three stories above the ocean. Ocean Power Technologies has plans for several sites, the first of which is already under construction off Reedsport. Located 2 ½ miles off the coast, it will contain ten PowerBuoys, an underwater substation, and a submarine cable to deliver power to the Pacific Northwest electric grid. The projection is that this will produce enough power to supply 375 homes (4,140 MegaWatt-hours/year). The buoy will be 140 feet long and 40 feet wide, with a 30-foot float. Pressure to find alternative sources of energy come from many sources. Two of these are the fact that Oregon’s Renewable Energy Action Plan calls for 25% of the energy used in the state be from renewable sources by 2025, and another is the fact that the price of oil continues to escalate. Wave energy conversion is in its infancy; regulations, permits, and policies are just being developed. Knowledge of how it will impact the environment is limited. There are concerns that the electromagnetic fields of the converters will disorient migratory birds and animals. What effect will the converters have on housing and tourism? How will the converters effect fishing, clamming, and crabbing. Those in favor of wave energy conversion are pushing to make the process move more quickly. Diverse opposing groups are trying to slow process to allow time for a more orderly progression. There is no agreement at this point on where the converters will be placed. Just as the companies that want to place converters off the coast are scrambling to get their claims staked, counties and cities on the coast are struggling to evaluate and rank which sites should be protected. Oregon State University has produced a territorial sea map that concluded that only two percent of the coastal waters are available for wave energy conversion use. The rest of the coastline is used for fishing or has environmental protections. Wave energy converters will mar the views along the Oregon Coast. Oregonians need to decide quickly, where and how many of these converters we want alone our coast, or if we want them at all. 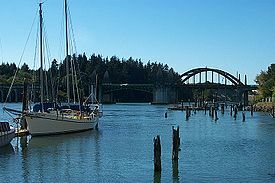 On the northwestern tip of Oregon you will find Warrenton on a finger of land between the beautiful Pacific Ocean and the Columbia River. A small town of approximately 4,000 people, Warrenton has a several interesting attractions. On the beach lies the Peter Iredale, a sailboat that shipwrecked over 100 years ago. Since it was possible to pull the boat out of the sand, it has remained where it became stuck. The ocean is slowly claiming the remains of the vessel. However, at low tide you can still walk up to the boat. Battery Russell, a part of Fort Stevens was built and activated in 1904. It remained in use until the end of World War II. Battery Russell has the distinction of being one of the few places on the mainland of the United States to have been fired upon by the Japanese during World War II. There is no record of anyone being killed at Battery Russell, but there are many reports of ghost sightings there. There are even photographs that claim to show moving orbs and ectoplasmic masses. So, if you would like to see a scary ghost or two, check out Battery Russell. For those who crave excitement, Warren offers two activities sure to get your heart pounding. How about trying paragliding? On Sunset Beach you can get training and fly either single or duo up to 3,000 feet above the beach and the ocean. For something a little less thrilling, you can take a Zip Line Tour. High Life Adventures provides a 2 ½ hour tour over thirty acres of breath taking scenery. Once you have on your safety gear, a harness, helmet, lanyard, and a trolley, you are hooked to a line. As you soar between 15′ – 60′ above seasoned timber, ponds, and a private lake, you will experience the one of the closest things to flying. Children under 15 years of age must be accompanied by a parent. 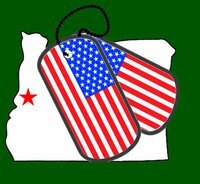 If you enjoy playing gold, and can qualify, you can sign up to participate in the Annual Oregon Coast Invitational Amateur Match Play Tournament. You can enjoy yourself and contribute to a good cause at the same time. The proceeds from the tournament, now in its 102 year, go to fund a scholarship for local high school graduates to further their education. This year’s tournament began on July 21st and will end on July 28th. Some divisions fill up rapidly so you need up register well ahead of time. Warrenton is an delightful place to visit. Being only about an hour’s drive from Portland, Portlanders can easily slip over for a day, or an afternoon.